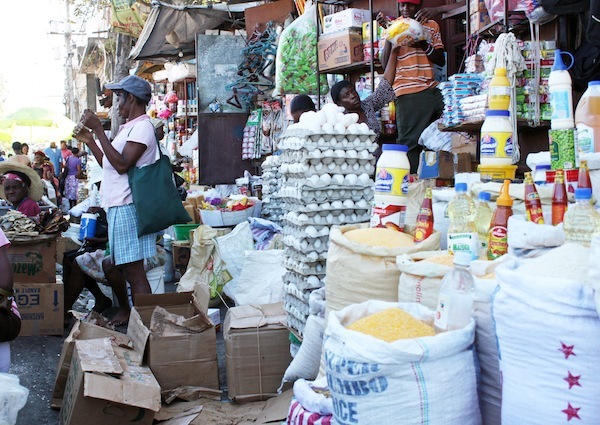 The vendor – who refused to give her name for fear of reprisal from Haitian tax collectors – sells vegetables and other food products at Croix des Bossales, the biggest open market in Port-au-Prince. Here, as in Haitian supermarkets, mountains of Dominican pasta, towers of Dominican eggs, mounds of Dominican plantains and piles upon piles of tomato paste, ketchup, mayonnaise and other prepared foods are everywhere. Haiti has food. But less and less of it is produced inside the country, and great deal of it now comes from the Dominican Republic, the Haiti Grassroots Watch (HGW) investigative journalism partnership has discovered. Haitian products are difficult even for merchants to find. “We can’t find them. They hardly even exist,” one egg seller attested as she sat next to a tower of eggs in grey Dominican egg crates. In hardware stores, sacks of Dominican cement reach the ceilings. In most of the eight stores visited by HGW teams, salespeople said cement from the neighbouring nation sold at a lower price than the “Haitian” product, which is actually imported and then bagged in country. On Jan. 12, 2010, an earthquake struck Haiti, killing some 200,000 people and left over one million homeless. It also destroyed 8 percent of capital goods, according to the World Bank, and the agricultural sector alone suffered losses of 8 million U.S. dollars, according to the Haitian government. In addition to lost crops and damage to key transportation infrastructure, irrigation systems in the earthquake zone were severely damaged. The dire need for food and other goods – for earthquake victims as well as thousands of international humanitarian workers – served the Dominican agricultural and industrial sectors well, according to Circé Almanzar Melgen, vice president of the Association of Dominican Republic Industries, who noted that it had "positive effects for industry, especially for those producing construction materials". But even before the catastrophe, the Dominican Republic was doing well. Since the earthquake, "Dominican exports to Haitian have grown considerably," wrote Magdalena Lizardo of the Dominican Republic's Ministry of Economy, Planning and Development. According to Lizardo, exports grew from 647.3 million U.S. dollars in 2009 to 869.23 million in 2010 to 1.018 billion U.S. dollars in 2011. "If we exclude the exports from the Free Trade Zones, Haiti has been – since 2010 – the top recipient of Dominican national exports, which were valued at US$575.6 million in 2011, slightly higher than the US$570.8 million exported to the United States," Lizardo added. Maria Isabel Gasso, president of the Santo Domingo Chamber of Commerce and Production is clear on the reasons for the increase: "First of all, you need the products. There is a market that is buying, but there are not suppliers selling. You need certain products. If you had factories and industries that suffered [because of the earthquake], then there is even more need." “Haitian cement is more expensive, but it’s better,” a worker at one store, GB Hardware said. “Dominican cement is cheaper, but it’s also lower in quality.” At another store, Alliance Distribution S.A., a salesman reported that it getting Dominican cement delivered was “easier and quicker”. Haiti undoubtedly needs these products. But is the flow of Dominican products a simple matter of exports, or is Haiti’s neighbor exploiting an economy weakened by a devastating earthquake? Even before Haiti became independent in 1804, its economy was mostly extroverted, and governments after the revolution rarely developed economic policies that encouraged national industries and modernised agricultural production to keep up with population growth. Local elites tended to export raw goods such as coffee, cacao, indigo and sugar and import foodstuffs and finished products. Haiti did not follow the “import substitution” trend that swept most ex-colonies in Latin America, Africa and Asia in the 1950 and 1960s, and up until the 1970s, Haiti was largely self-sufficient in fruits, vegetables, meats and cement. Since then, the country has suffered an increasingly negative trade balance. “We are following a growth model that weakens productive sectors to the benefit of imports and importers,” explained economist Camille Chalmers, professor at the State University of Haiti and director of a platform of organisations who promote “alternative development”. The bordering Dominican Republic, however, followed a different path. Neoliberal economic policies – reduction of protective tariffs, privatisation of state industries, and cuts to social services – at the end of the twentieth century took its toll on Haiti’s ailing economy. Tariffs on food and other agricultural products were first cut in 1982 and plummeted to zero or three percent in 1995. Today, Haiti has the lowest tariffs in the Caribbean. The drastic reductions were part of the 1994 “Paris Plan”, an agreement between the exiled government of Jean Bertrand Aristide and international actors such as the United States and the International Monetary Fund (IMF) in which the Aristide government would enact a series of neoliberal policies in exchange for international support for its return to power in 1994 after being overthrown in a bloody coup d’état in 1991. Since 1995, Haiti’s trade balance has widened, from about 500 million U.S. dollars that year to about 2.2 billion dollars for the 2011-2012 fiscal year, according to the IMF. Similarly, the food “deficit” has grown from 242 million U.S. dollars in 2000 to 342 million dollars in 2007. According to the Haitian Ministry of Agriculture, Haiti imported 57 percent of its food in 2005. That figure is undoubtedly higher today. The neoliberal policies affected the economy in other ways too. The Aristide government had to sell off state enterprises, among them the state cement company, even though Haiti possesses all the raw materials necessary for cement. Still, imports and lowered tariffs are not the only reasons Haiti’s agricultural production hasn’t kept pace with population growth. Factors such as the lack of public and private sector investment in agricultural production, or Haiti’s antiquated land tenure system, have all contributed. “When I came back to Haiti in 1976, we made everything: pipes, cement, etc,” remembered Gérald Emile “Aby” Brun, a vice president of the 30-year-old Haitian construction and architecture firm TECINA S.A, who regretted that his country no longer produces cement. The state telephone company, “the flour mill, the same thing happened to all of them”, he told HGW, blaming in part Haitian “capitalists”. Haiti Grassroots Watch could not find exact data on the amount of Dominican cement exported to Haiti, but the Dominican Association of Portland Cement Producers said that six major companies employ 15,000 people and that cement makes up 21 percent of the country’s exports. Many are calling for the Haitian government to rescue Haitian production, which cannot satisfy the nation’s demands. Dominican producers are increasingly capitalising on this weakness, especially since the January 2010 earthquake. “The Haitian state is not defending Haitian economic actors,” said Chalmers. Surrounded by mountains of Dominican vegetables and seated beside colleagues hawking Dominican pastas and eggs, the Croix de Bossales merchant agreed with Gasso. She wanted to see change but remained pessimistic.